NTT Advanced Technology Corporation (NTT-AT, headquartered in Kawasaki-shi, Kanagawa, Japan; President and CEO George Kimura) has added new functions to the English version(Robotic Process Automation Software OR-5200, launched May 22, 2017) of its RPA tool, WinActor®, which first entered the market in 2014. On September 10, the company will release a Chinese version (Robotic Process Automation Software OR-5300). It will begin accepting advance orders for these products on August 27. 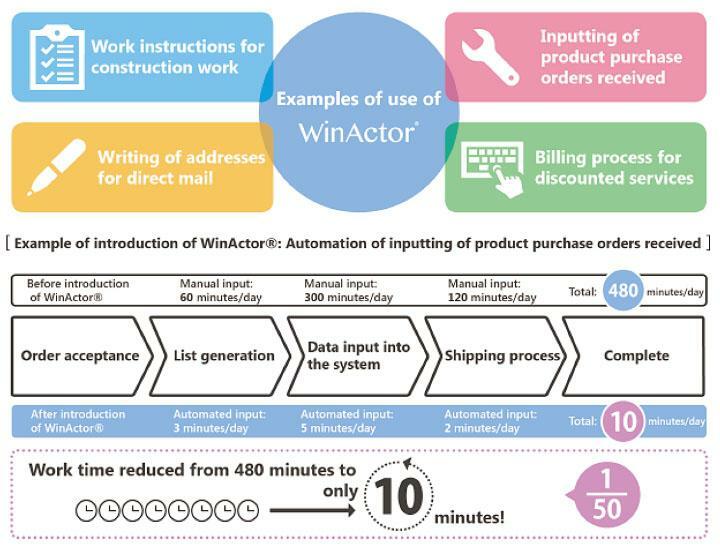 WinActor® is one of the RPA tools, which have been attracting attention as tools that support work style reform and improve work efficiency in enterprises. In Japan, it has been introduced in about 1,500 companies across a broad spectrum of industries, ranging from financial services through retail. NTT-AT views globalization and AI×robotics as priority business areas, in which WinActor® is a leading core product. The company has reinforced the functionality of its English version so that the product can be used more easily and efficiently, and will also launch a Chinese version to make the product accessible to customers in China. WinActor® is an RPA tool that NTT-AT has developed based on technologies invented by NTT Access Service Systems Laboratories. It initially records operations performed by Windows® applications and Web applications as a scenario and then automates those operations. It can accurately reproduce routinely recurring tasks or tasks that involve large volumes of data. In addition, without requiring any modifications to the existing systems concerned, it can automate complicated operations that have thus far been carried out manually or data input that involves a number of systems. It dramatically improves the efficiency, quality and cost-effectiveness of work that has previously been done manually. WinActor® can be applied to a wide range of business activities, regardless of business type or company size. ⇒ Data can be input in conjunction with the ODBC data source. ⇒ A scenario protection function and a log output control function have been added. ⇒　Operability of the scenario editing window has been improved so that scenarios can now be created or edited using simpler operations. The number of libraries available has been increased. It is now equal to the number of libraries available in the latest Japanese version, Ver. 5.1. ⇒ Developer tools have been added for Chrome and Microsoft Edge. By using WinActor® libraries for these browsers, the user can now automate processing on Chrome or Microsoft Edge without any need to use image matching or emulation. Note: This is different from the template creation function of Internet Explorer. ⇒ The Chinese version provides functionality equal to that of the Japanese Ver. 5.1 and the functionality added to the English version, including the library environment. ⇒ The Chinese version is now easily accessible to users in China. NTT-AT will begin accepting advance orders on August 27. With a view to expanding global sales of WinActor®, NTT-AT will seek to combine it with various business solutions and AI-assisted solutions. Note: WinActor® is a registered trademark of NTT Advanced Technology Corporation.